The Apostle Thomas knew Jesus had died on Calvary having been tortured crucified and pierced with a spear. He also knew that on the third day, Easter Sunday, when the women arrived at the tomb to anoint his body, it was empty. 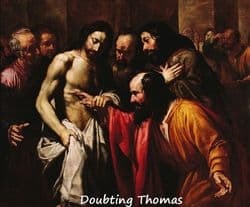 However, despite the abundance of evidence from his closest friends, -Mary Magdalene, Mary the Mother of James & Joseph, the Emmaus disciples, Simon Peter and the other nine Apostles- Thomas refused to accept that Jesus had risen from the dead or that He appeared bodily in front of each of them! Although Thomas’ faith was slow, he remained loyal, he didn’t leave the other ten Apostles, he persevered and eight days later Jesus returned! “My Lord and my God,” soothe my fears and grant to me a perfect belief in You, the Risen Jesus. Today in 1861, the first transcontinental telegraph line was completed across America. Send an old friend a message today and tell them you prayed for them.